Learn more about Max's award-winning writing. 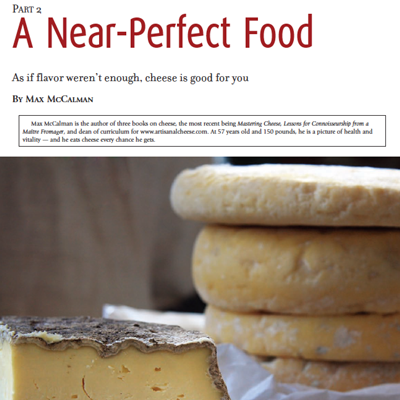 From the foremost master of cheese in the country, Max McCalman, comes a practical twist on wine and cheese pairings that includes detailed information about the history, production and unique flavor of fifty of the world's finest cheeses, as well as the accompanying information about the best wine varietals and vintages to pair them with. The easy-to-navigate swatchbook format fans out to reveal the ideal wine and cheese match for any occasion. Max McCalman, the foremost master of cheese in the country, introduces a first-of-its-kind master's class to usher the cheese enthusiast to the level of full blown connoisseur. 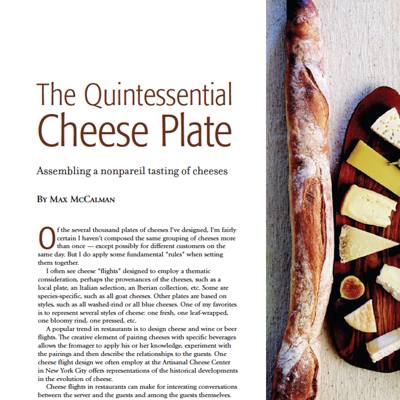 It is the next step after Max's first book, The Cheese Plate, and the perfect pairing with his second book, Cheese: A Connoisseur's Guide to the World's Best. Winner of the 2011 World Best Book on Cheese Award from Gourmand International at the 16th Annual Gourmand World Cookbook Awards in Paris and designated Finalist for the prestigious International Association of Culinary Professionals 2011 Cookbook Awards. An expansive reference on the world's finest cheeses and their wine pairings. It won a 2006 James Beard Foundation Award. The definitive book for cheese lovers that lays the groundwork for the appreciation of cheese, was nominated for awards by the James Beard Foundation and by the International Association of Cooking Professionals.